My first job was working at a baseball card shop in Ames, Iowa. Every day after middle school, I’d walk three blocks to Mr. Tryon’s store on Main Street and do God’s work: numerically sort cards and serve as Old Man Tryon’s errand boy. Child labor laws being what they were in early 1980s Central Iowa, the job was a cashless gig. I was paid in baseball cards. And more importantly, in loose meat sandwiches. On truly special days, my boss would walk out from his office at the back of the shop with a crisp five- or 10-dollar bill and ask me to run down the street to the Maid-Rite restaurant. Because he was a benevolent soul, he’d buy me one, too. Thus began my love affair with one of the Midwest’s most underrated delicacies. To be clear, no one considers loose meat sandwiches haute cuisine. 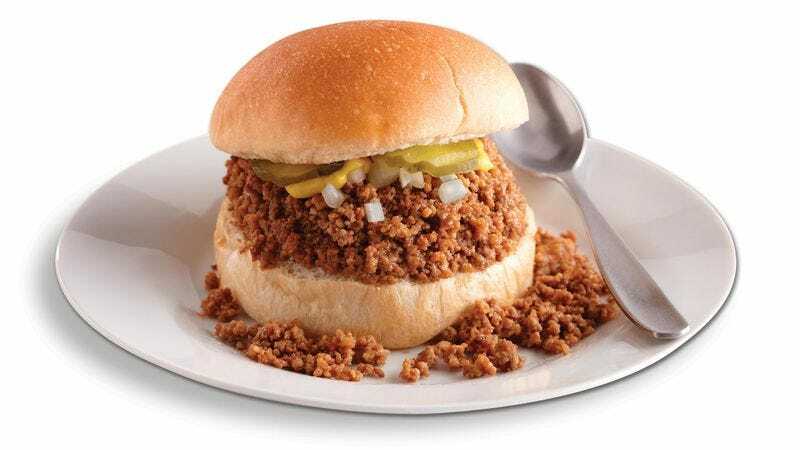 Essentially a sloppy joe minus the sloppy joe sauce, the sandwiches consist of small pebbles of lightly seasoned hamburger meat spilling out from a standard white bun. Think of them as an inefficient but delicious method of consuming ground beef. So much of the meat falls out as you lift the sandwich to your mouth that a spoon is required to scoop up the piles left behind. Nothing fancy here. The bun soaks up the grease, making even the bread a bit gloppy. Somehow it works. Unlike a hamburger patty, loose meat is essentially porous, thereby allowing condiments to burrow into the protein. This gives a depth of flavor that’s hard to achieve in a plain old burger. It’s a matter of engineering—because there’s more surface area coated in seasoning, and more beef gets browned when it contacts the grill top, loose meat sandwiches manage to deliver more beefiness and flavor. As with anything worth its salt, the loose meat sandwich isn’t for everyone. My wife, bless her non-Midwestern heart, doesn’t see the point. She’s not a fan of the messiness and considers it a downgrade from a hamburger patty. But then, she’s from Boston. Boston! They stuff lobster in a roll, so I shouldn’t expect such effete palates to embrace the down-home humbleness of a loose meat sandwich. Legend has it the loose meat sandwich (known in snootier circles as a “tavern sandwich”) was invented in 1924 by a man named Dave Higgin at Ye Olde Tavern in Sioux City, Iowa. Others say it was invented four years earlier by an equally enterprising chef in Montana. But that doesn’t fit my narrative, so I’m sticking with the Iowa connection. Either way, the first Maid-Rite was created a short time later, in 1926, by loose meat legend Fred Angell in Muscatine, Iowa, launching the modern-day loose meat empire. The appeal for Midwesterners was genuine. Unpretentious and affordable, the sandwich became a staple in small towns throughout the region. The restaurants were usually as simple as the sandwich—ma ’n’ pa diners with wraparound counters, Naugahyde-covered seats, and often (for both cost and practical reasons) plastic utensils. When Roseanne Barr’s character opened a restaurant in the quintessentially Midwestern sitcom Roseanne, the menu was built around the venerable loose meat sandwich. Though not as plentiful as they were during the halcyon days of the Roseanne revival, loose meat purveyors still dot the Midwestern landscape. At The Barn in Brainerd, Minnesota, you can get a loose meat sandwich for just $3.70. At NuWay in Wichita, Kansas—considered by some to be the mecca of loose meat sandwich chains—a large “crumbly burger” will set you back $3.39. A medium saves you 40 cents. There is no small. “People just love it,” said Bradley L. Burt, president and CEO of the Des Moines-based Maid-Rite Corporation, which oversees 36 Maid-Rite restaurants across five states. Its unfussy ethos imbues the entire operation: When you call the company’s headquarters, Burt himself answers the phone. Mea culpa: Growing up, I always put catsup on my Maid-Rite. I sold almost all of my baseball cards to help pay for college. I have a few of the best ones left, which I will give to my kids when I’m convinced they’re old enough not to ruin them. Also, and more importantly, I’ll pass on my love for loose meat sandwiches. It’s the greatest love a father can give.